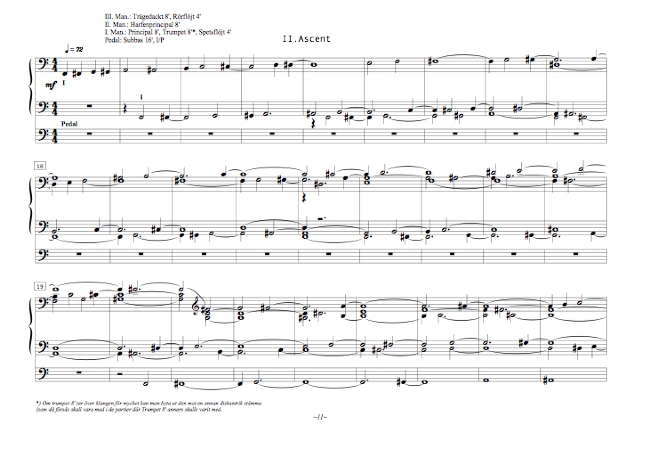 Descent - Ascent for Church Organ, written for Henrik Cervin, is part one and two of a three-movement sacred work partly inspired by the Gospel of Thomas - a text found in its entirety as late as 1945 in Egypt in a Coptic translation (only fragments of the Greek original text have been found). Descent starts with the creation of the world, a cluster that ends in the fall from grace - an 11-tone melody slowly moving down in register. The combination of a Bach prelude and coptic liturgic singing symbolizes an attempt, a prayer to stop this downward fall. Ascent is, naturally, about moving up again. It was originally written for choir and consists of dense chords formed by chromatic lines slowly moving upwards. Descent is also available in a version for piano and electronics, dedicated to my brother Magnus Sköld, who premiered the piece on his diploma concert 2004. The third movement in this series is simply called The third element and is a four-channel electroacoustic piece with clouds of sine waves mixed with the sounds of water and fire. 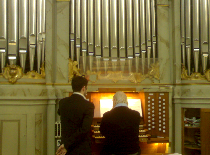 Henrik Cervin, former church organist of the Cathedral of Gothenburg, premiered the piece in that cathedral on August 19, 2005. He later went on to tour with the piece, performing in many churches throughout Sweden, also taking the music to St. Mary's Cathedral in Tallinn, Estonia.